One way to know for sure that spring is around the corner besides the facts that the weather might be getting warmer (hopefully) and the daylight hours are longer (for sure) is that you will find asparagus more plentiful and on sale this time of year.It really reaches its peak between March and May, but it has been on sale in my area for that last week or so and it always one of our favorite vegetables to eat with just about any meal. There are several good ways to make asparagus, but one of my favorites and one of my favorites to do any vegetable is by roasting it. This recipe from Williams-Sonoma is a very easy one to make with just a few ingredients that you can enjoy during the weeknight or with a more elegant dinner. Position an oven rack in the upper third of the oven and preheat the oven to 450 degrees. Arrange the asparagus in a single layer on a rimmed baking sheet. In a small bowl, whisk together the olive oil, minced garlic and the lemon zest. Brush the asparagus evenly with the oil mixture, turning the spears to make sure each one gets coated well, and then season the asparagus generously with salt and freshly ground black pepper. Arrange the lemon wedges around the asparagus on the baking sheet. Roast the asparagus until it is tender and just starting to turn a golden color, about 6 to 8 minutes. Transfer the asparagus to a warmed serving platter and drizzle it with any pan juices before serving. Just a couple of things about asparagus in general. When you buy it from the store, you want to be sure that you choose spears that have bright green stalks and just a hint of purple color in the tips. If the tips are already starting to brown or the asparagus feels limp, choose another batch. If you are not planning to cook the asparagus that same day you need to make sure you store it properly so it doesn’t go bad on you. You can simply stand the spears upright in a pan filled with about 1 inch of water and refrigerate them until you are ready to cook them. They need the water to stay fresh and you should see them in water at the grocery store or on ice to keep them fresh. When you trim them, just make sure you cut off far enough to get rid of the woody stem at the bottom. Thicker asparagus does tend to need to be peeled so they cook more evenly, but if you buy thin asparagus you can get away without peeling them. 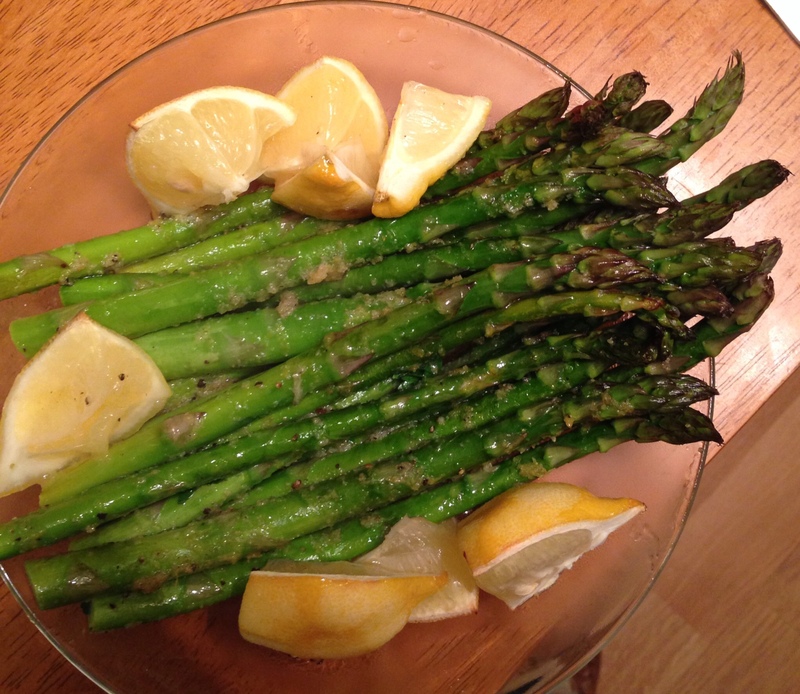 This simple dish gives you great lemon flavor with the hint of garlic that goes so well with asparagus and it takes less than 10 minutes to make so you can do this one any night of the week. Thanks! It is a really simple recipe and the results are fantastic. Thanks for checking out the blog and leaving a comment!